Randy and I are officially back at work today ! The last two weeks seem like a bad dream. We buried my mom on Mothers Day. The last week with her was a week that I will never forget. Mom had very little pain and near the end slept most of the time but the times she was awake and talking to us was so comforting. I have no doubt where my mom is spending eternity. If you believe that a person can have one foot on earth and the other in Heaven…. that was our last week with mom. The things she said gave us all a glimpse of Jesus and she was a pure example of dying grace. We’ll miss her but know my dad – who has barely had time to get settled in – is grinning from ear to ear. Meet Sport – our new dog. My mom got Sport when she was diagnosed 4 years ago. Glasses ! When I got back Dillion had new glasses . Kynley checked out the octopus glasses. Cute turtle project they made last week. Some of the learning activities on the table. Can you SEE the ocean in there? Can you hear the ocean in there? Shiny/ Dull,… the list goes on and on. 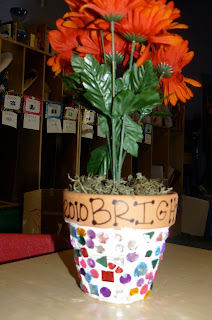 This is one of the Mothers Day projects Beth and Jodie made with the kids. CUTE! Great job girls! They even made an extra for me !